This is a turkey divan recipe without canned soup — and yes, it’s the one you’re looking for. 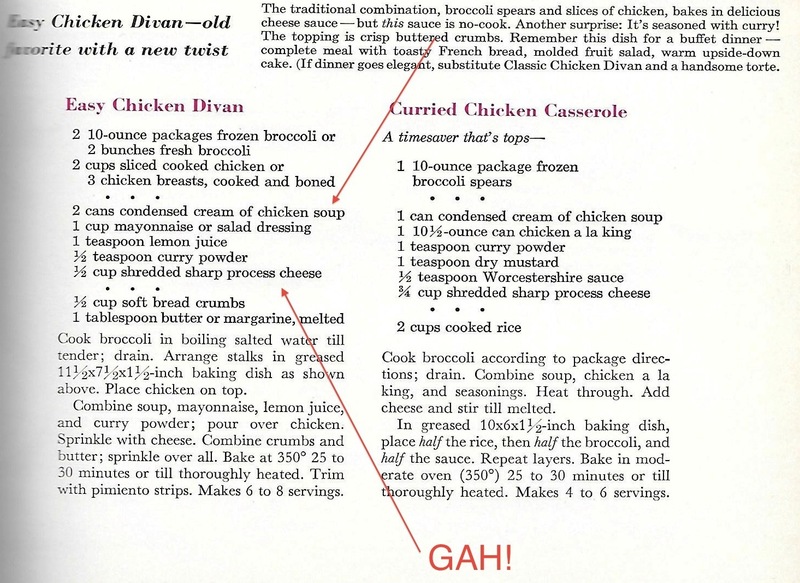 Below, I give a little history of the recipe, but if you just want the recipe itself, skip to the bottom of the page. 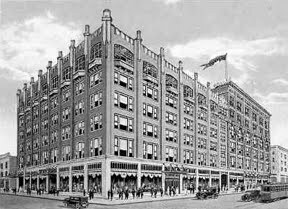 The Late, Great Younker’s Department Store. Read my ode to working in the famous tea room. I first came across Turkey Divan when I was working in one of the long-gone restaurants of Younker’s Department Store in Amerique profonde. Made by layering steamed broccoli with sliced cooked turkey breast, with a rich cheese sauce amidst the layers, it was one of those wonderful American classics that were the mainstays of department store tearooms and old-school hotel dining rooms. American, you ask? Divan sounds kind of French. Indeed, according to what research I could find, the recipe was the specialty of the Divan Parisien, a French restaurant in a New York Hotel (the long-gone Hotel Chatham, near Grand Central Station). Wait–is it Divine or Divan? Is it turkey or is it chicken? It’s Divan. And the original recipe was for chicken, but someone along the line discovered that it worked beautifully with turkey, too. What does Divan mean, anyway? According to my Oxford French-English Dictionary, divan means divan. Yes, as in a davenport. 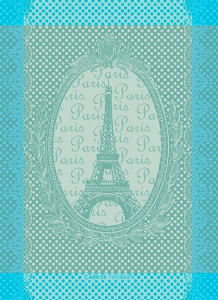 But it’s a Parisian davenport, mind you. I can only guess that the restaurant’s name, “Divan Parisien,” was supposed to bring to mind an elegant place to sit yourself down. 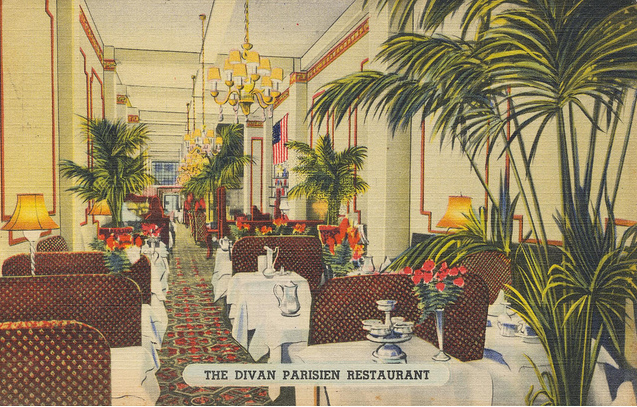 And, looking at a vintage postcard, it looks like the place was all about divan-style seating. And yet, Turkey Divan is not elegant in a complicated, rococo way. In fact, the term “polished simplicity” comes to mind whenever I taste a great version. (I always say no one does polished simplicity quite like the French–and this dish is definitely French-inspired). Turkey Divan begins with one of the most simple-elegant things in the culinary world: a white sauce (a béchamel). When was the last time you stopped and really tasted a white sauce? I did, the other day when I was testing this recipe, and I was thrilled once again by the magic that happens when a warm paste made of melted butter and flour turns milk something so rich and wonderful. For this recipe, you add a great cheese (and nearly any great cheese that melts well will do); the white sauce becomes a cheese sauce. Or, in French cooking terms, a béchamel becomes a Mornay. Seriously? It’s as good as all that? 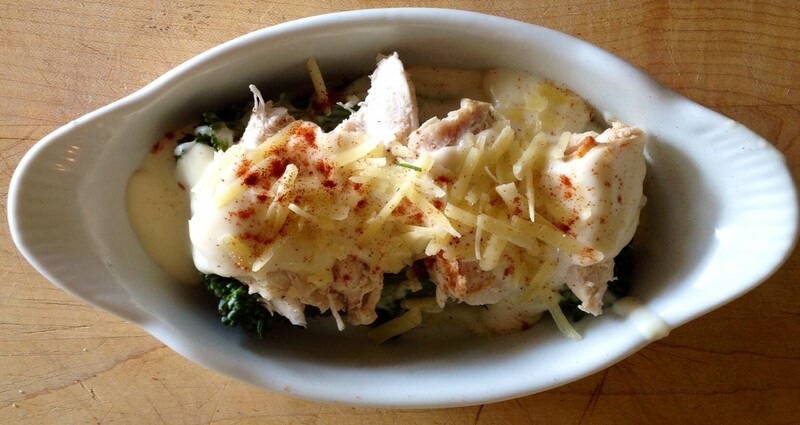 Whenever I’ve tasted Turkey Divan, it’s been kind of…..ordinary. Well, here’s what happened: Over the years, our mothers and grandmothers started substituting cream of mushroom or chicken soup instead of making a white sauce. Condensed soup is to béchamel what Velveeta is to a Vermont Cheddar. Still, I’m not judging here: If I’d grown up cutting heads off chickens, sweeping Dust Bowl dirt from my floorboards three times a day, and scratching every bit of food I could from the grit of a substinance farm in the anything-but-Martha-Stewart 30s and 40s, by the 1950s, I would have looked at condensed soup as a beacon of salvation from the drudgery of all that work. I would have been first in line for an electric can opener. And if buying cheap process cheese meant that you’d be able to save enough money to finally afford that beautiful readymade dress in the Younkers window after years of sewing your own clothes, well, pass me the Velveeta. But now that we have the time and (if we’re blessed) the resources to get back to scratch cooking, it’s time to get back to making the Mornay sauce. And making Turkey Divan in the legendary way. Here are some step-by-steps to this great dish; just skip below if you want the recipe. 1. Gather up your ingredients (see recipe listing below). 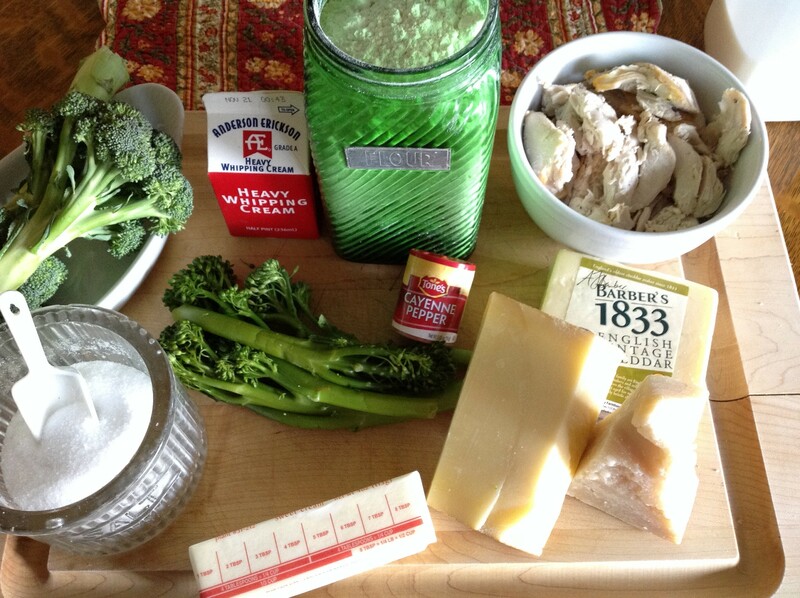 You can use broccoli, which is classic, but I love broccolini (pictured in the center). 2. Make a White Sauce (a Béchamel), and then turn it into a cheese sauce (a Mornay) with your favorite flavorful melting cheese. What cheese to use in Turkey Divan or Chicken Divan: Both Comté and Cheddar work beautifully here. You can also use Gruyère, Asiago, Fontina, Gouda (though not hard-aged Gouda), Muenster, Havarti, and Monterey Jack. I would not use blue cheese for this. 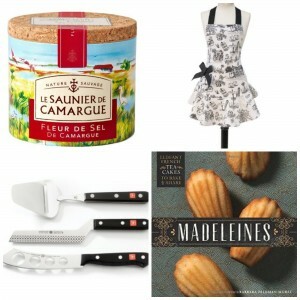 You could use Brie or Camembert if you cut off the rind. 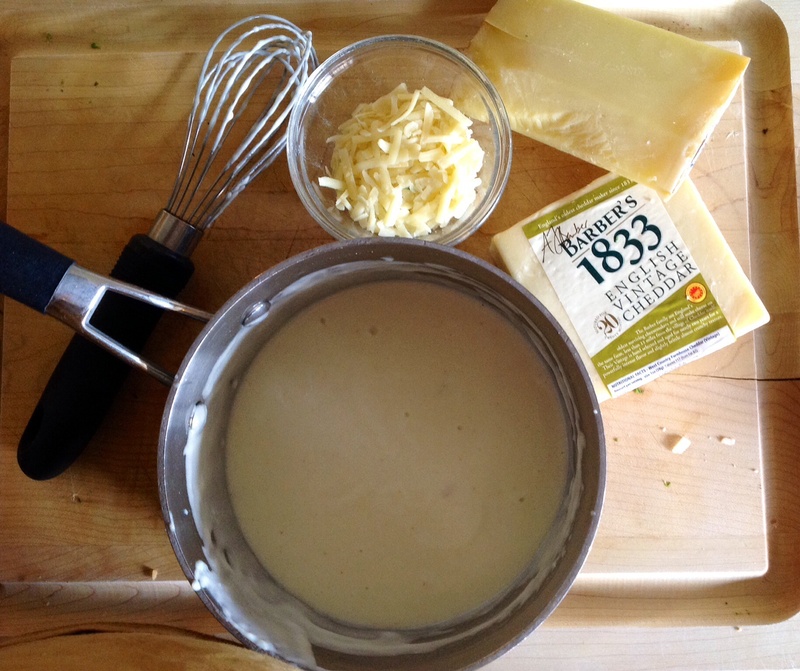 A white sauce becomes a cheese sauce (that is, a Béchamel becomes a Mornay). And it’s a wonderful thing. You’ve simply forgotten. 3. Layer Your Ingredients: The broccoli or broccolini should be cooked until just tender; the turkey should be warm (heat it gently in the microwave). The sauce should still be warm. This is key, because you only run it under the broiler for just a few minutes. PS: I like using Individual Gratin Dishes for these, but a larger gratin dish will work too. Just be sure whatever dish you use is broiler safe. 5. A layer of cheese and a little paprika. 4. Broil until nicely bubbly and a little bit brown. If you don't have individual gratin dishes, you can use an 8x8 or 9x9 casserole, or even a round baking dish. Just make sure it can stand the heat of your broiler. You may need to broil the larger casserole longer, but do watch constantly. 2 tablespoons grated Parmigiano-Reggiano cheese or other great grating cheese of your choice. Or, you can simply add more of the cheese you used in the sauce. Melt butter. Add flour and cook, stirring, until mixture bubbles. Remove from heat; gradually blend in milk and cream. Add cayenne and salt. Cook, stirring constantly, until mixture is thickened and begins to boil. Add Gruyère and cook, stirring, until cheese is melted. 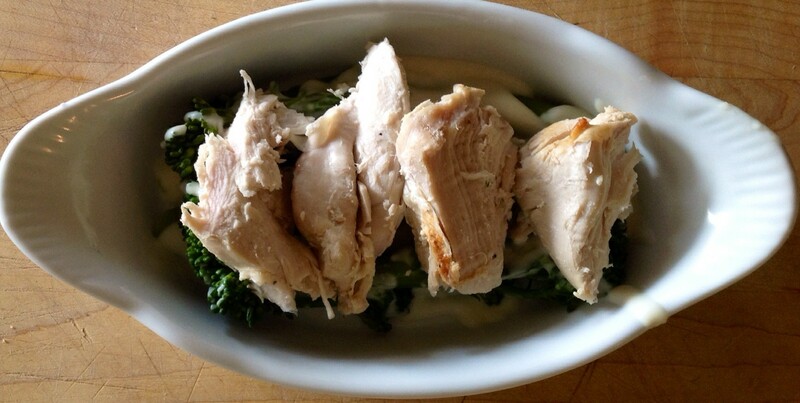 Warm the broccoli or broccolini and the turkey in the microwave. 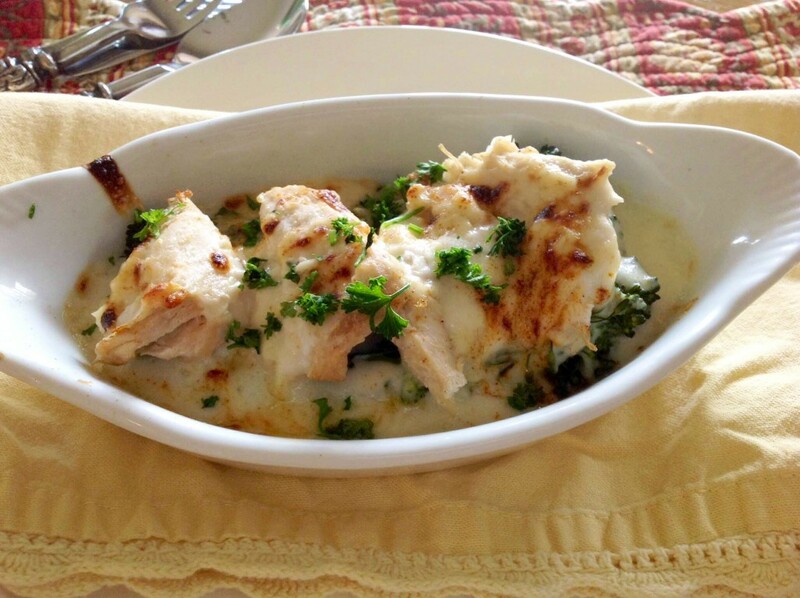 Divide broccoli or broccolini amongst 4 individual broiler safe gratin dishes (or use a broiler-safe 8x8 gratin dish) spreading out into 1 layer. Pour about ¼ cup sauce over each dish. Layer turkey atop the broccoli; cover with the remaining sauce. Sprinkle with Parmigiano-Reggiano cheese. Broil about 4 inches from heat for about 5 minutes or until cheese is browned, watching constantly. Serves 4. • To cook broccoli florets: Cook in about 1 inch of boiling salted water for about 6 to 8 minutes or until just crisp-tender. To cook broccolini: Trim ends. Cook in 1 inch boiling salted water for about 4 minutes or until just crisp-tender. PS: If you’ve found this post helpful, please consider supporting my work on this site. It’s so easy–and costs you nothing: Next time you want to buy something from Amazon, simply go to Amazon.com through one of my links or ads (such as the ones, below). No matter what you buy, I’ll get a small commission from your purchase–even if it’s not the item I’m advertising. Thank you so much for your consideration. 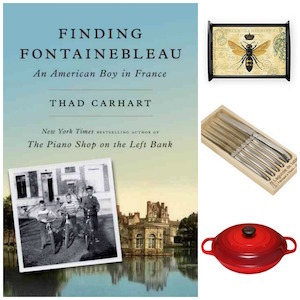 • Five French ways with leftover turkey: A great casserole, crêpes, vol-au-vents, and more. 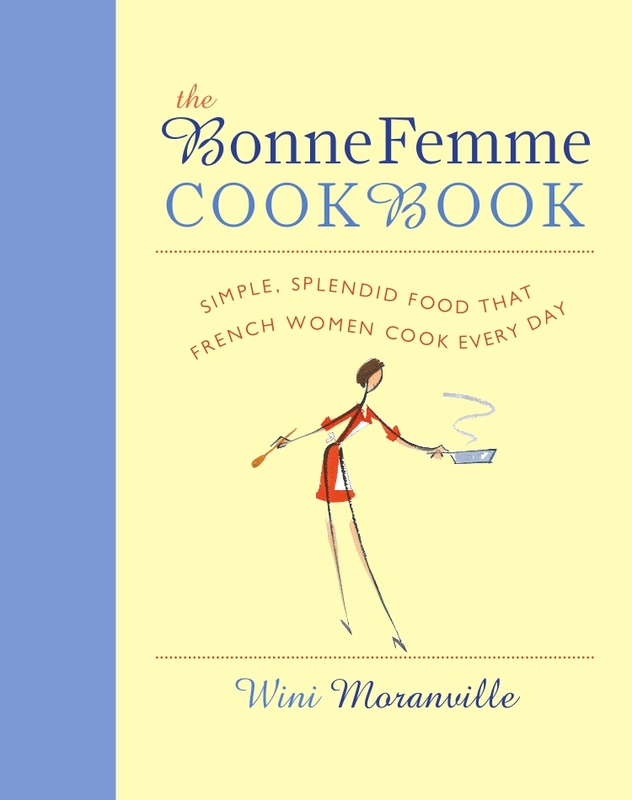 • Five French ways with leftover ham: Croque monsieur, soufflé, French pizza, and other ideas. • Great Gift Ideas for the Cook: Help support this site by checking out some of these epic gifts. • Three good, inexpensive sparkling wines: These would be my choice for serving with Turkey Divan. • Swiss Chard Salad: Looking to go light + healthful with your leftovers? Make this great winter salad, which is great with turkey. Made this tonight. Loved it! It was reminiscent of the way I remember it as a child. My 2 adult sons also liked it a lot. Glad to hear it! It’s worth roasting a turkey just to have leftovers for this recipe, methinks.